One thing to watch out for is that the promo is really $10 off the first month rather than a temporary upgrade. 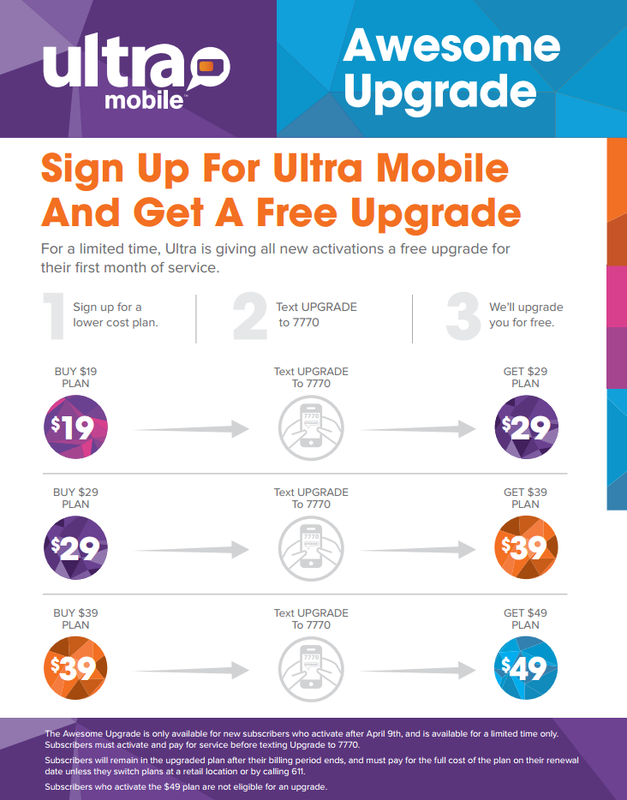 You will remain in the upgraded plan after your promotional month ends and must pay for the full cost of the upgraded plan on your renewal date unless you switch plans at a retail location (store locator), online at Ultra.me or by calling 611 before the promotional month ends. 1 Additional minutes are available: 50 minutes for $1, 125 Minutes for $2.50 and 250 minutes for $5. Added minutes expire at the end of the current plan month. 4 Throttled data speed is approximately 256 Kbps. Additional 4G data is available: 250 MB for $5. Added data replaces any remaining data in the account and expires at the end of the current plan month. All Ultra Mobile plans include international direct dialing, 4G HSPA+ data and unlimited global SMS. Also included is Call Me Free, a no extra charge service that provides local access numbers in 40 countries that non-US family members and friends can use to call Ultra customers for the price of a local call. One of the best priced T-Mobile MVNO's. Phenomenal international rates. Native T-Mobile coverage....hence the sacrifice. Remember that T-Mobile even when there are roaming agreements does not always roam on partner carriers like AT&T, etc. Since I have been with H2O, I don't remember the last time I called them for anything.